Today we are pleased the present a short-fiction prequel to Barry Lyga’s winning YA series I Hunt Killers! 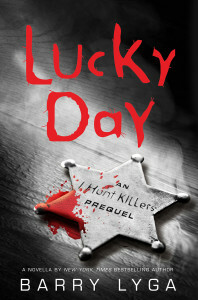 The Prequel to I Hunt Killers, “Lucky Day” expands on Jasper “Jazz” Dent’s story from an unexpected perspective: a sheriff who barely knows Jasper’s name. “Lucky Day” begins with A (probably) Dead Girl and G. William Tanner’s desperate search for her abductor and (likely) killer. But as G. William likes to remind his audience, this is no CSI thriller; this is the story of a violent crime in a small town with limited resources, an aging sheriff, and political opponents ready and willing to use the recent crimes as a means of taking down the old sheriff. Battling age, grief over the recent loss of a beloved wife, an obnoxious reporter, an upcoming election, and a frightening dearth of evidence, G. William must decide whether it is better to leave the case for the next sheriff (and whether he can bear to leave the victims unavenged.) But then again, do such even questions matter if he can’t find any clues to the killer anyway? Must he leave in defeat, with failure and a killer at large as his last contributions to the town of Lobo’s Nod? Available now as an e-book, this more adult prequel to the Young Adult series I Hunt Killers explores the unglamorous world of those who spend their lives trying to protect the innocent, and the effect on a close-knit town when a killer threatens the safety of their most vulnerable. The Fiction Reboot will have more new release features coming soon–keep a weather-eye out this summer for some of our favorite authors and their sequels!